Transport - efficient or resilient? It seemed that the train company is badly prepared to deal with such sudden events, which could be extreme weather events like flooding or storm or any other interruption. 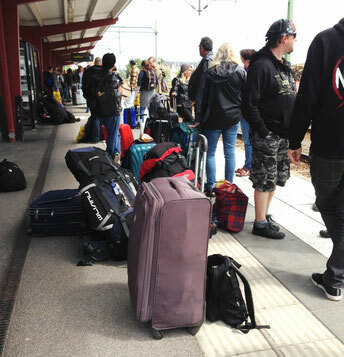 Why the train operators were not flexible enough to let the other train come up to us and then return, thus bringing folks to Stockholm or Copenhagen airport in order to catch their flights? It would not have solved the problem for all passengers, but definitely for many. I observed a similar problem with the S-trains in Frankfurt recently. After a heavy rainfall event the track was blocked in Offenbach. And this is the only connection out to our town. There is hardly any bus line running in parallel that one could use instead – probably for efficiency reasons. Keeping redundancy is not a popular issue in our nowadays public transport systems. It is seen as something negative, thereby, it could make the system more resilient. Is there no other way? Just efficiency or resilience? I have also experienced another case. The Copenhagen metro seems amazingly flexible for me. If something goes wrong, it is usually solved within minutes. The metro is a driverless system and operated from a central point. Easily they can establish a forth and back going shuttle service if a link is broken and people can move on very soon. This approach and mind set of the operator provides a higher flexibility while keeping the operational costs still down. Sure the high technology supports that further. Already the planning of the Copenhagen metro in the mid-nineties had been exceptional as it considered climate change impacts such as higher flood levels. And under the big urban flood in 2011, the metro proved its resilience. It was still running while the trains and many busses had stopped. In summary, it seems that there are solutions to be efficient and resilient in the transport system. This requires however to be aware of the possible climate impacts and to think out of the box. It would go beyond business as usual solutions that often just hand the burden over to the transport users in form of not getting to work or home, delivery interruptions and income losses. How does it work in your area? the case study on the Copenhagen Metro.